This night is celebrated the last full weekend of August. There are many places you can take your child (or just yourself) to learn more about bats. Many zoos have bat houses, and some parks have special bat activities for families in the evenings. 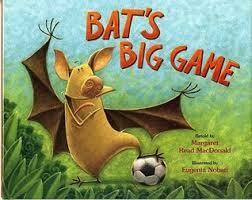 Of course you can pick up a few picture books to enjoy Bat Night also! 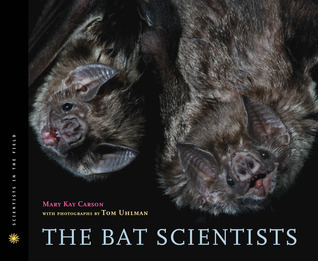 This picture book classic is a favorite among bat lovers. Poor Stellaluna gets separated from her mother during an owl attack and ends up in a bird’s nest. She tries her best to act like a bird, but she just can’t ‘get the hang of it’. Crawly things for lunch are disgusting, it’s hard to see in the daylight, and she just can’t seem to sit upright! But one evening, Stellaluna flies on without her bird friends and ends up lost again. She tries hanging by her thumbs and going to sleep, but a bat approaches asking her what she’s doing. The bat explains that what’s wrong for a bird, is not wrong for a bat. When the bat hears Stellaluna’s tale of escape from an owl, she sniffs her closely and wraps her wings around her. 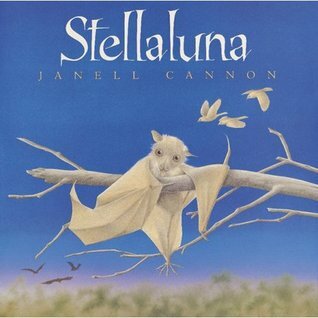 The bat is Stellaluna’s mother who thought she had not survived the attack. With her mother, and the other bats, Stellaluna learns how to behave like a bat. She is so excited that she returns to the nest to tell her bird friends. They try to act like bats too, but soon learn that they cannot. They can however still be friends! The animals and birds were having a big game. The animals wore blue shirts with a big letter A on the front. The birds wore red shirts with a big letter B on the front. The game was about to begin, when Bat flew in. He wanted to play for the winning team. He looked them both over and decided that he wanted to play for the Animals because they looked big and strong, and he had teeth and fur like the Animals. But when the score was 2-1 in favor of the birds, Bat changed his mind. He wanted to play for the Birds because he wanted to be on the winning team, and he could fly. So he switched teams and played with the birds. After a little while, the Animals started to win and Bat tried to switch teams again. This time he was caught switching shirts. Now, neither team wanted him, because he wasn’t a loyal team player. Bat had to give back both shirts and leave the field. Bat is still not sure which team he should play for, but he is practicing his game! This 80 page non-fiction book is geared for the older child, but I know many younger children who love to hear facts about ‘gross’ or ‘creepy’ animals, and bats! In this book children learn about basic information about bats, predators, bat caves, super-exciting bat secrets and myths about bats. For example most children know that bats help us by eating their weight in pesky insects like mosquitos every night, but did you know that ‘a chemical in vampire bat spit, that breaks up blood clots, helped scientists develop a new treatment for people who’ve had strokes’? You can learn and share so much more with a curious child. Apparently echolocation isn’t the only way bats communicate. 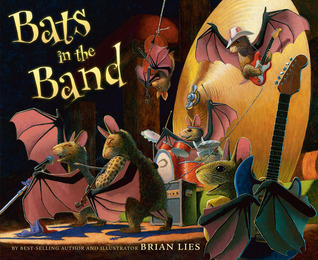 In this rhyming picture book, bats gather nightly for a concert at music hall. They listen to operas, country ballads, the blues, thumping rock and roll, and even a one-bat band. When the morning light fills the sky, so do the bats on their return home. And high in the rafters, the young bats dream of being in the band. Great choices. I just LOVE Stellaluna! Great story and so many things you can do with it in the classroom or a library program. Yes, Jane. It was one of my staples. The artwork alone is amazing! Now that I have more free time, I have time to find new books too.